Having a backyard picnic and need something #AllAmerican to send through the air-waves. 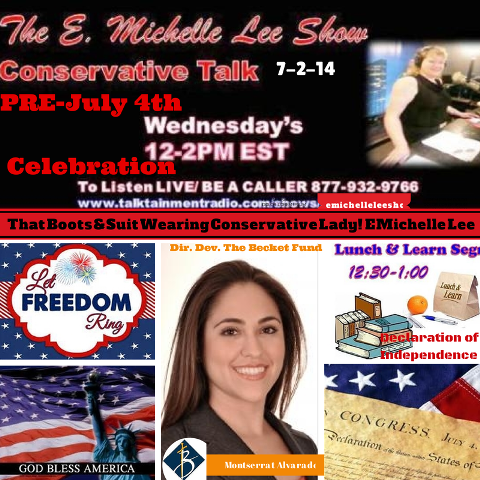 Download the free podcast of the July 4th Special of the #EMichelleLeeShow; Americas Boots and Suit Wearing Conservative Lady and Truth Seeker for the People’s Politics and Social Commentary on Talktainmentradio-com . Kicking off the Celebration with Reba McEntire’s “What IF” song to encourage ALL AMERICANS to participate in the celebration of our Great Nation; America. No recognition could be merited without our honor to that ol Flag that makes every heart covered in Freedom. 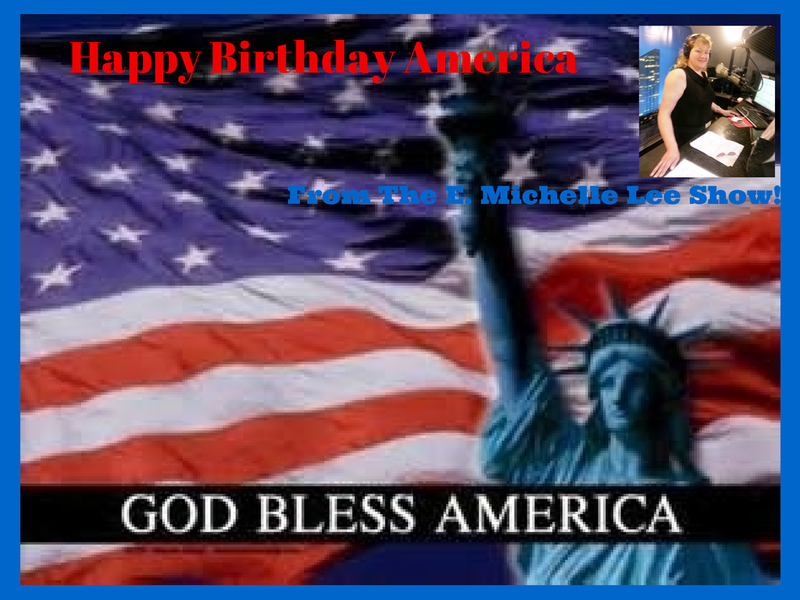 Have your family stand up, cover their hearts, and say the Pledge of Allegiance to the United States of America’s Flag. Ask your family to remain standing for the singing of the National Anthem by 9 year old Athena Creese. Please be seated as we bring to you updates on the very issue that brought our founding fathers to these here lands in search of #ReligiousFreedom from King George during the Magna Carte. Which led them to the journey on the Mayflower by which we now have established this country with the Mayflower Compact that led to the Declaration of Independence for which our Constitution and Bill of Rights were born. 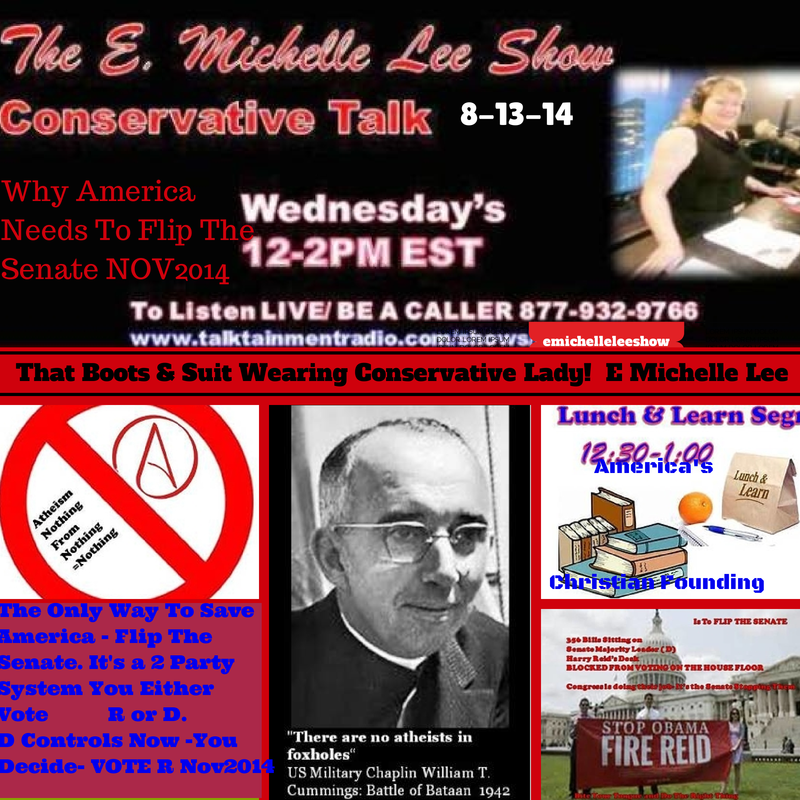 E. Michelle Lee, radio show host, one of the first reporters to interview with The Becket Fund’s Director of Development and Communications, Montserrat Alvarado, who reported on the insights of the US Supreme Court’s decision on the #HobbyLobby Case regarding the #ReligiousFreedom of business owners to refuse the Mandate of Obamacare to NOT provide 4 of the 20 contraceptives provided in Obamacare because they may cause abortion of a life that has already begun. Monste also talks about some of the other cases they are working on that pertains to the core values of America and her people. Such as the case involving, “One Nation Under God” in our Pledge of Allegiance, and the case where prisons are refusing ministers to come and preach and teach the inmates for religious grooming. Tune in to get the details. Stick around to provide your family an entire American Liberty Fun Filled Celebration and show them why it’s important to keep our heritage ALIVE! 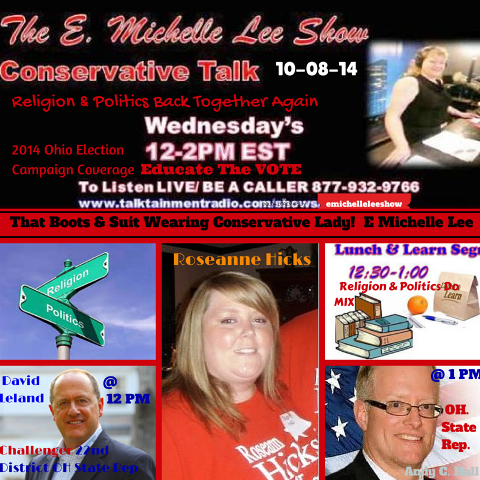 God Bless America sung by original artist Kate Smith – Up Next E. Michelle goes into the weekly segment, Lunch-N-Learn, finishes her interview with Monste Alvarado from The Becket Fund. Enjoy a taste of American Heritage and History with this clip of a HBO mini series from 2008 with a reenactment of the day that the Declaration of Independence was adopted in the Continental Congress of 1776 July, 2nd. Hear actor Paul Giamatti in character of John Quincy Adams speech “While I live, Let Me Have A Country, A Free Country”. This is a must hear for every American Family. Especially while celebrating our 238th Birthday of America! 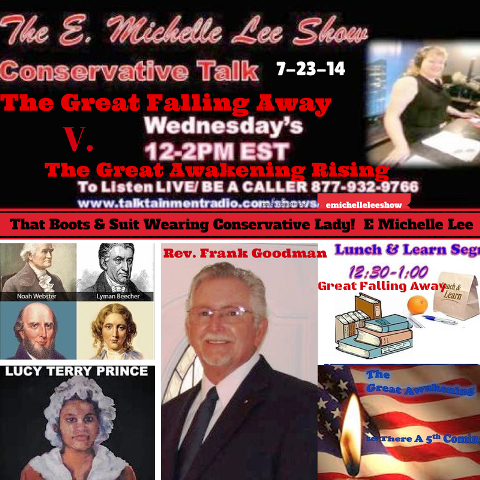 Gather the family around, hush the crowd, everyone needs to hear this; E. Michelle wraps up the segment with the reading of the Declaration of Independence by Max McLean. 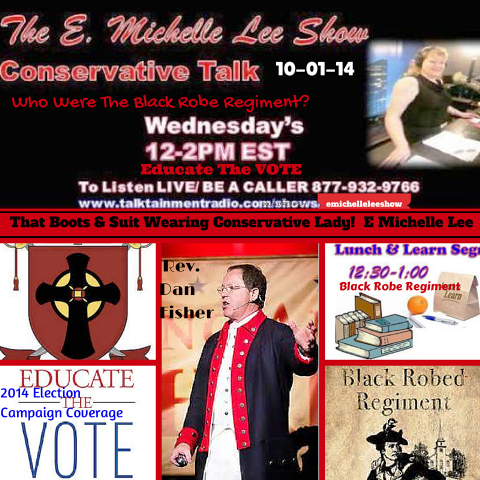 3 things you can do as an American to ensure our History/Heritage and Freedom continues…. (see end of article for 3 tips and links to documents from Wallbuilders.com). 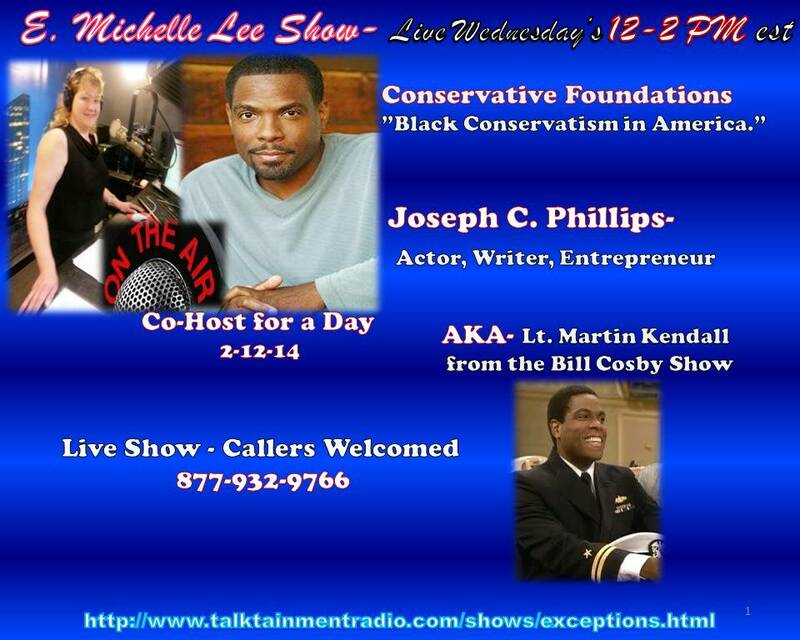 Today LIVE 12-2PM EST on the #EMichelleLeeShow ; Actor, Conservative Columnist #JosephCPhillips co-Host for a day on Talktainmentradio.com! Phillips has been very busy since his days as Lt. Martin Kendall on the Bill Cosby Show. From being in films such as Strictly Business and four other box office hits, to Broadway Plays, and on to playing major roles on various TV hit series like: General Hospital, The District where for two seasons he appeared as Mayor Morgan Douglas , recurred as Marcus Johnson on the hit CBS series Without A Trace, appeared as JT Morse on the Fox Series, Vanished, and most recently recurred on the NBC series The Event.